In a world where game-changing innovation has become the norm, the Digital Transformation Initiative (DTI) provides a unique insight into the impact of new technology on business and society. The last several years brought such an array of exciting new ideas to market that it is now almost ‘normal’ to expect game-changing innovations to come off the product line every week. The first commercial self-driving car hit the road, courtesy of Tesla; so did Uber’s driverless taxis. Amazon and other companies pilot commercial drone deliveries. Facebook (FAIR) and Google (TensorFlow) created open-source repositories to accelerate machine learning research, while radiologists used deep learning to improve early identification of Parkinson’s disease in medical scans. The next major wave of innovation is now pegged on virtual reality (VR) and augmented reality (AR), where Microsoft’s HoloLens is continually breaking new ground. The base technologies that have made all of this possible (e.g. mobile, cloud, sensors, analytics, Internet of Things or Artificial Intelligence) also unleash combinatorial effects that accelerate progress exponentially. This is the context in which digital innovation is now disrupting business and operating models, and making some profound impacts on society. To maximize the opportunities surrounding digital innovation, the World Economic Forum launched the Digital Transformation Initiative. The initiative has assessed the impact of digitalization on 13 industries and across six cross-industry topics. This work has brought us into direct contact with more than 400 executives, policy-makers and experts, who have helped uncover some key themes for ensuring the value of digitalization is captured by both business and society. The initiative has developed a value-at-stake framework to provide an evidence base and a common language for public-private collaboration focused on ensuring that the benefits of digital transformation are fairly and widely shared. At the heart of this framework is a new concept, digital value to society, which provides a helpful metric for measuring, optimizing and communicating the societal impact of digital investments. 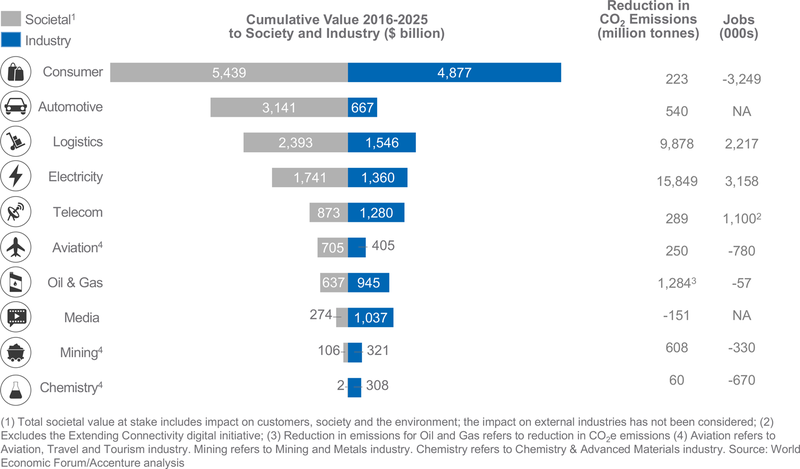 To date, this work has confirmed that digitalization has immense potential: we estimate it could deliver around $100 trillion in value to business and society over the next decade. There are barriers to its realization – e.g. unfit regulatory frameworks, infrastructure gaps, a lack of public trust in new technologies – but, if stakeholders are incentivized correctly, the majority of that value should accrue to society. The value of digitalization across the industries analysed by the Digital Transformation Initiative.